The name of the organization shall be the Northwest Chapter of the "American Association of Physicists in Medicine," hereafter to be referred to as the "Chapter." The “American Association of Physicists in Medicine” shall hereafter be referred to as the “Association” Or the “AAPM”. A. To promote the application of physics to medicine and biology. B. To encourage interest and training in medical physics and related fields. C. To prepare and disseminate technical information in medical physics and related fields. It is organized exclusively for charitable, scientific, and educational purposes as defined under Section 501(c)(3) of the Internal Revenue Code of 1954 (or the corresponding provision of any future United States Internal Revenue Law). The Chapter shall be incorporated in Maryland, as a Tax Exempt Non-Stock Corporation, under the address and agency of AAPM Headquarters. Section 1b. No part of the net earnings of the Chapter shall inure the benefit of, or be distributable to, its members, trustees, officers, or other private persons, except that the Chapter shall be authorized and empowered to pay reasonable compensation for services rendered and to make payments and distributions in furtherance of the purposes set forth herein. No substantial part of the activities of the Chapter shall be the carrying on of propaganda, or otherwise attempting to influence legislation, and the Chapter shall not participate in, or intervene in (including the publishing or distribution of statements) any political campaign on behalf of any candidate for public office. Notwithstanding any other provision of these articles, the Chapter shall not carry on any other activities not permitted to be carried on by a) a corporation exempt from Federal Income Tax under Section 501(c)(3) of the Internal Revenue Code of 1954 or the corresponding provision of any future United States Internal Revenue Law, or b) a corporation, contributions to which are deductible under Section 170(c)(2) of the Internal Revenue Code of 1954 or any other corresponding provision of any future United States Internal Revenue Law. Section 1c. In the event of dissolution of the Chapter, the Executive Board of the Chapter shall pay or make provision for the payment of all the liabilities of the Chapter. The residual assets of the organization will be turned over to one or more organizations which themselves are exempt as organizations described in Sections 501(c)(3) and 170(c)(2) of the Internal Revenue Code of 1954 or corresponding sections of any prior or future Internal Revenue Code, or to the Federal, State, or Local government for exclusive public purpose, as the Executive Board shall determine. The jurisdiction of the Chapter shall include the states of Alaska, Hawaii, Idaho, Montana, Oregon and Washington, and the provinces of Alberta and British Columbia, and contiguous areas not served by other Chapters of the Association. The Chapter shall have the authority to solicit members in the Northwest Region of the United States without prejudice toward future formation of other chapters within this region. 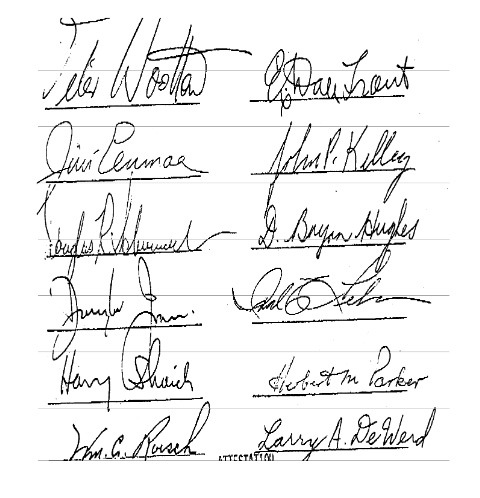 Upon approval by the Board of Directors of the Association of the petition to form a Regional Chapter and the signature of the petitioners to the Constitution and By-Laws of the Chapter, the Chapter shall become obligated with respect to the relevant provisions of the Articles of Incorporation and By-Laws of the Association. The Chapter shall not use the name of the Association nor obligate in any way the officers or members of the Association without first obtaining written approval of the duly authorized representative of the Association. The Chapter shall be divided into two classes of membership, including Professional Members, and Corporate Members. Only Members who are simultaneously Members of the Association may hold the offices of President, President-Elect, Secretary-Treasurer and Representative Board Member to the Association. The privilege of voting for the Representative Board Member and amendments to the Constitution shall be limited to Members who are simultaneously Members of the Association. Membership is open to individuals who are professionally engaged in, retired from, or students training in the application of physics to medicine or biology. They shall be interested in the purposes of the Chapter as expressed in Article II. They shall meet standards as specified in the By-Laws. 3 Corporate Membership may be held by individuals who are interested in the application of physics to medicine or biology and in the purposes of this Chapter, but do not practice professionally. This typically includes vendor representatives. The manner of election of the officers shall be provided in the By-Laws. Any and all amendments to this Constitution must be proposed in writing, bearing the signature of at least three Members of the Chapter in good standing who are also Members of the Association. The proposed amendment with a supporting statement explaining why the proposed amendment is thought desirable shall be submitted to the Secretary-Treasurer at least one month before the next Chapter meeting. A copy of the proposed amendment with its supporting statement shall be mailed to each eligible Member by the Secretary-Treasurer at least two weeks before the next Chapter meeting, and the agenda for the meeting shall provide for a discussion of the proposed amendment. The Secretary-Treasurer shall prepare a summary of the discussion, a copy of which, after it has been approved by the Executive Committee, shall be mailed with a paper or electronic ballot to each eligible Member no later than one month after the Chapter meeting. Only ballots returned within one month from the data of mailing by the Secretary-Treasurer will be valid. The Secretary-Treasurer shall tabulate results. The adoption of the proposed amendment shall require the affirmative vote of two-thirds of the Members voting. After announcement at the next Chapter meeting of such adoption by vote, the amendment shall become effective. Section 1. The officers of the Chapter shall be the President, the President-Elect, the Secretary-Treasurer, the Immediate Past President, and the Representative Board Member to the Association. Only Members in good standing may hold office. Section 2 (Duties of the President). The President shall preside at all meetings of the Chapter and shall preside over meetings of the Executive Committee. He shall set the exact dates for the Chapter meetings and shall call such meetings of the Executive Committee as he deems necessary. Section 3 (Duties of the President-Elect) The President-Elect shall act in the place of the President in his absence, and he shall serve as Chairman of the Program Committee. He shall succeed to the office of President after his term as President- Elect has expired. Section 4 (Duties of the Secretary-Treasurer). The Secretary-Treasurer shall be responsible for all correspondence and records for the Chapter and shall have custody of the funds of the Chapter and shall execute the financial transactions of the Chapter. He shall also act as second Vice-President. The Secretary-Treasurer shall maintain membership records and communicate chapter information to the membership. Section 5 (Duties of the Representative Board Member to the Association). The Representative Board Member to the Association will represent the Chapter as a member of the Board of Directors of the Association. If the Representative Board Member cannot attend a meeting of the Board of Directors of the Association, the President of the Chapter shall appoint an alternate Representative. Section 6 (Duties of the Past-President) The immediate Past-President shall serve on the Executive Committee of the Chapter. Section 7. The terms of office of the President, and President-Elect shall be one year. . The term of office of the Secretary-Treasurer and the Representative Board Member to the Association shall be three years. No officer shall serve more than two consecutive terms. Section 8. Vacancies occurring during the year among the officers may be filled by qualified persons appointed by the Chapter's Executive Committee. Persons appointed will remain in office until the next annual Chapter meeting. Section 1. The Executive Committee will consist of the President, the President- Elect, the Secretary-Treasurer, the Representative Board Member to the Association, and the Immediate Past-President. Section 2. The Executive Committee will conduct the business of the Chapter during the time between Chapter meetings. Section 3. The Executive Committee shall appoint the members of the Program Committee and may appoint such other committees as it considers necessary. Section 1. Application for any of the classes of membership in the Chapter shall be made on a form designated by the Executive Committee. Each application shall be submitted to the Secretary-Treasurer and shall be endorsed by a Member of the Association who has personal knowledge of the applicant. Section 2. The Secretary-Treasurer or another Executive Committee member shall review each application for accuracy and either approve, disapprove, or recommend a different class of membership. The Secretary-Treasurer shall notify the applicant and the Executive Committee promptly of the results of the review, and the acceptance of new members shall be announced at the next Chapter meeting. Section 3. Membership in good standing in the Association shall be considered as sufficient, but not necessary, qualification for membership in the Chapter. The requirements for eligibility for membership for persons who are not Members of the Association shall be as set forth in Article VI of the Chapter Constitution, and an academic degree in physical science or engineering shall be required. In special cases the Executive Committee may consider as eligible for membership individuals who fail to meet the academic requirement who can demonstrate adequate experience and who have contributed significantly to the field of medical physics. Section 6. When circumstances change such that a Member no longer qualifies according to the requirements of the Chapter, his membership shall terminate at the end of the fiscal year. Membership in any of the classes may be terminated following prolonged nonpayment of dues, at the discretion of the Executive Committee. Section 1. There shall be at least one regular meeting per year. They may be held jointly with other related professional organizations. Section 2. The president may call additional meetings. Section 3. The order of business for any Chapter shall be prepared by the President and approved by the Executive Committee. Section 4. Except as provided, the parliamentary procedure of the Chapter shall be in accord with the current edition of "Robert's Rules of Order. Section 5. Two elected officers and three members shall constitute a quorum. Section 1. The business year of the Chapter shall coincide with the business year of the Association. Section 2. The amount of annual dues shall be determined by the majority of the Chapter Members present at the Annual Chapter Meeting and will be effective for the next annual dues cycle. Section 3. The President shall appoint an Audit Committee consisting of two Members. They shall report the results of their audit at the Annual Chapter meeting. Section 1. Nomination for officers shall be made by a Nominating Committee consisting of a chairman and two other members appointed by the Chapter's Executive Board. The Nominating Committee shall select one nominee for each office to be filled. No Member shall be nominated without his consent. Nominations for officers may be made by at least two Members after consent has been obtained from the nominee and must reach the Secretary at least six weeks before the Annual Chapter meeting. The Secretary shall prepare a paper or electronic ballot to be mailed to the voting membership not less than four weeks before the Annual Chapter Meeting. The closing date for the receipt of ballots by the Secretary shall be one week before the Annual Chapter Meeting. The Secretary shall report the results of the election at the Annual Chapter Meeting. A proposed amendment to the By-Laws must be prepared in writing and shall be signed by at least three Members in good Standing. The proposed amendment with a supporting statement explaining why it is thought to be desirable shall be submitted to the Secretary-Treasurer at least one month before the next Chapter meeting. At that meeting a vote shall be taken on the proposed amendment. The adoption of the proposed amendment shall require the affirmative vote of a majority of members in good standing present, and if adopted, it shall become effective immediately. We, the undersigned, being full members of the AAPM do hereby petition the Association for the formation of a chapter to be known as the Northwest Chapter of AAPM in accordance with Article VI, Section 1, of the By-Laws of the Association and the provisions of the foregoing Constitution and By-Laws of the Chapter. 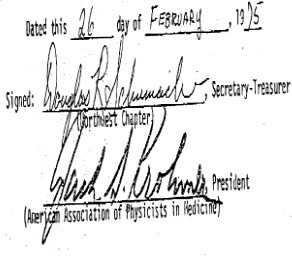 The Northwest Chapter of the American Association of Physicists in Medicine is duly authorized by the Board of Directors of the American Association of Physicists in Medicine to function as a Chapter of the Association in accordance with the provisions of the foregoing Constitution. Language was primarily changed to include electronic balloting and communication, simplify the membership structure and increase the secretary treasurer term to 3 years to be consistent with the other officers. The requirement of the chapter president to prepare an annual report to the Association president was deleted. All Amendments were unanimously approved by membership vote at the meeting.